One of the most beautiful Russian violin concertos on an album that also includes all of Glazunov’s concertos for piano, cello and saxophone. With many thanks to Mr. Paul Underwood, the Russian National Orchestra and a generous anonymous donor. My first acquaintance with the Glazunov Violin Concerto occurred at a summer music camp. I was 10, and my eight-year-old sister and I were attending the storied Meadowmount School of Music in New York’s Adirondack Mountains. We lived off-campus with our mother at “The Old Mill” boarding house. Some college-age students were also staying there, including a young undergraduate from Juilliard who had the room next to ours. He was learning the Glazunov. He diligently practiced it slowly for up to eight hours daily for eight long weeks, finally performing it at the end of camp. Every day, from the time I woke up to the time I went to sleep, the sound of the Glazunov was in my ear, and I couldn’t get enough of its beautiful melodies and intriguing musical language. When I was 15, I finally learned the concerto myself at another summer music camp, the Bowdoin International Music Festival in Maine. One of my best friends from the teenage dorm was also learning it at the same time, and it was fun to encourage each other and exchange ideas for fingerings and phrasing. The Glazunov has been part of my regular concerto repertoire ever since. It took me a while to figure out the secret to the formal structure which had previously seemed rather amorphous, like a tone poem. It turns out that the second movement is a completely self-contained entity, in a traditional ABA form. It eluded my detection at first because it’s inserted into the middle of the first movement! The concerto, played without pause, proceeds like this: exposition of the first movement, entire second movement, development of the first movement, recapitulation of the first movement, cadenza of the first movement, entire third movement. As strange as that looks on paper, the musical flow of this gorgeous concerto sounds completely natural. I have never heard of any other piece of repertoire where the second movement occurs between the exposition and development of the first movement. If you ever come across one, please let me know! One of the distinguishing characteristics of Glazunov’s music is his detailed instructions regarding dynamics and tempo changes. A generation earlier, composers such as Tchaikovsky left many of the phrasing decisions to the interpreter. If you approach Glazunov’s melodies as though they were Tchaikovsky’s, there are certain obvious ways to shape the phrases. But these are usually not what Glazunov indicates with his very specific hairpins. At first, some of his ideas seem almost upside down or inside out, but once you get used to them, a very individual and compelling musical personality emerges. For those of you who know and love the violin concerto but are not yet familiar with Glazunov’s other works for solo instrument and orchestra, this album will be illuminating. It is always a great honor to collaborate with José Serebrier who has recorded and championed Glazunov’s complete Symphonies. 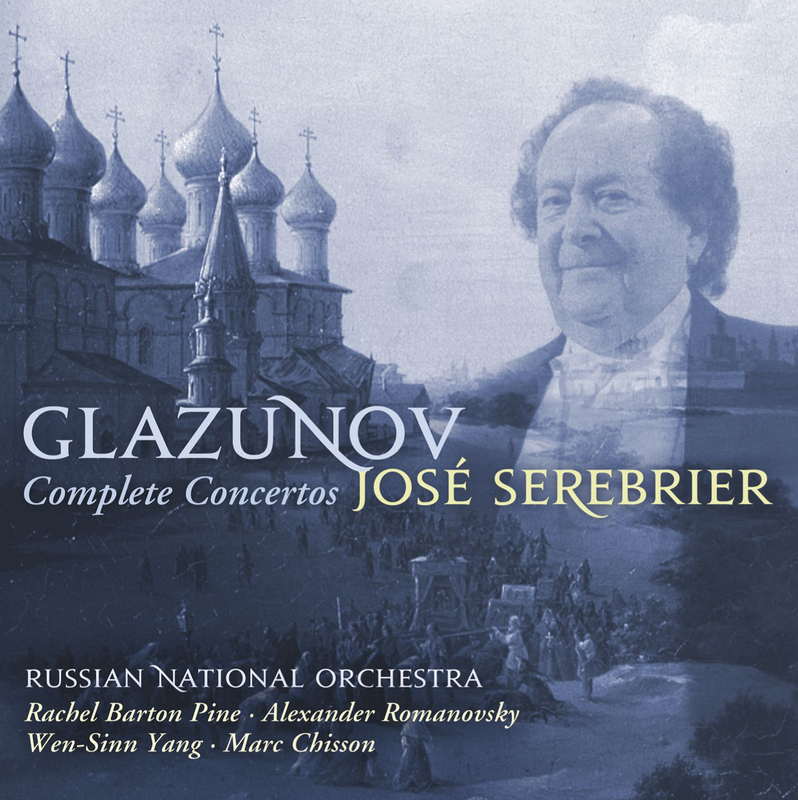 Maestro Serebrier and I have worked together many times in recent years on a variety of repertoire, and his intimate knowledge of Glazunov’s music made this project especially rewarding for me. I would also like to give my heartfelt thanks to Steve Epstein and Richard King for their wonderful work as producer and engineer, and to the generous donors without whom this recording could not have happened.